Our first day in Vietnam started by eating breakfast. Ahaha! I know I'm not a good joke but meals are important. My brother in law who is staying there temporarily for a work assignment bought us banh mi (it looks like Subway but tastes different) for breakfast. After having a tasty breakfast and a good catch up we then toured around Ho Chi Minh city. The tour that we did is a DIY (Do It Yourself) walking tour with my brother in law who acts as our tour guide. We visited the Opera House Saigon, People's Committee Building, Notre Dame Saigon and Saigon Central Post Office since these places are close to each other. We only paid for a taxi ride to get to the starting point which again is shouldered by my brother in law. Wow! We we're definitely blessed! For lunch we went to Nga Hang Ngon. The place is a walking distance from Notre Dame Saigon. I love their fresh spring roll there. Check out my previous post titled Vietnam's Glorious Feasts to get tips on where and what to eat when in Vietnam. You might want to check out our DIY Ho Chi Minh City walking tour from this link: The Heat is On in Saigon! Pedestrian Crossing in Saigon (Ho Chi Minh City) is crazy. But don't worry the vehicles won't hit you. Yeah right! 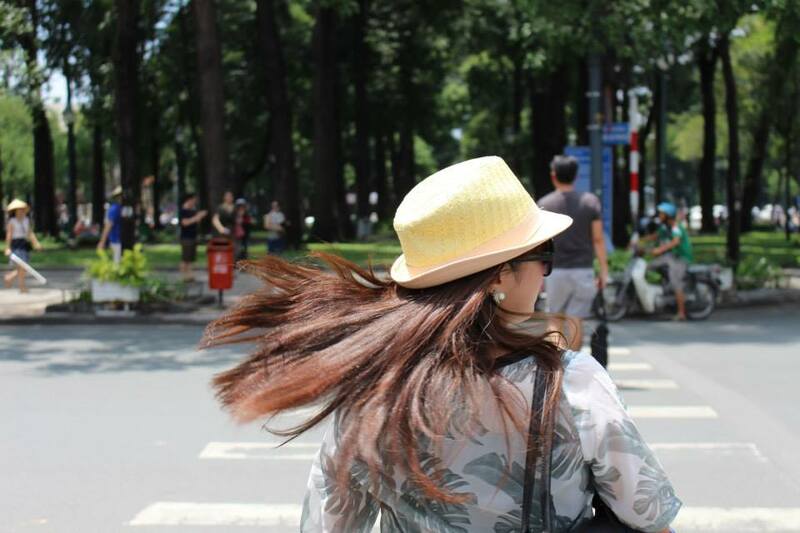 I remember crossing a busy street in Saigon with my husband, the road looks clear from our side of the road and so we started to get going but then suddenly we were caught in the middle of around 25 - 20 motorcycles coming at us. I let out a quick squeal. The feeling of fear and excitement of us standing at the middle of the road full of motorcycles coming at us enveloped me. I'm glad we've crossed safely. Ahahah! We've survive! Yes! We own it! My brother in law said to not worry about them vehicles hitting at you because they won't. They'll just try to adjust and steer clear from you when you cross the road. Sigh! That's a relief. In the afternoon, we booked a tour to Cu Chi Tunnel by Diamond Travel Co. Ltd at Pham Ngu Lao Street. This tour cost 120,000 VND for the bus tour + 90,000 VND for the Cu Chi Tunnel entrance per pax. The tour bus is clean and decent enough with good air condition. I really think that it's better to book the tour at Pham Ngu Lao Street as there are many cheap tour shops and options to choose from in there than booking the tour online cause it's a bit pricey. If I'm not wrong, the price of the tour online is triple the price compared to booking it on the spot at Pham Ngu Lao Street. 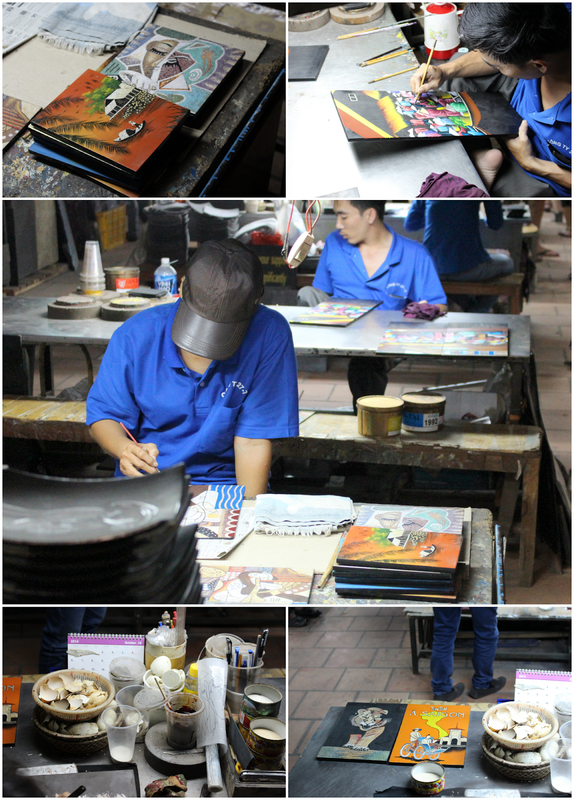 Our first stop for the tour at was Handicapped Handicrafts. You might want to prepare extra cash to buy art at Handicapped Handicrafts. #Tip : Prepare around 500,000 VND - 1,000,000 VND for small art items. They create really nice art with quality. By the way, they ship to countries all over the world in case you want to buy bulky art items from them. After our stop at the craft store we then headed to Cu Chi tunnel. Find out more regarding my Cu Chi Tunnel experience. Check out my previous post : The Cu Chi Tunnel Complex. The tour took 6 hours, good thing we bought snacks with us during the trip so our stomach didn't complain much before dinner time. There are many stores at Pham Ngu Lao Street so I'd suggest you to buy first before boarding the tour bus. I was travelling with my husband and a couple of friends from Singapore, so after our Cu Chi tunnel tour we then parted ways. They took a bus tride to Mui Ne after the Cu Chi tour by 8pm. We've made sure that they'd board that bus first before going for dinner. There was a minor issue at the shop when we checked on them good thing it was sorted out and they've manage to get there successfully. 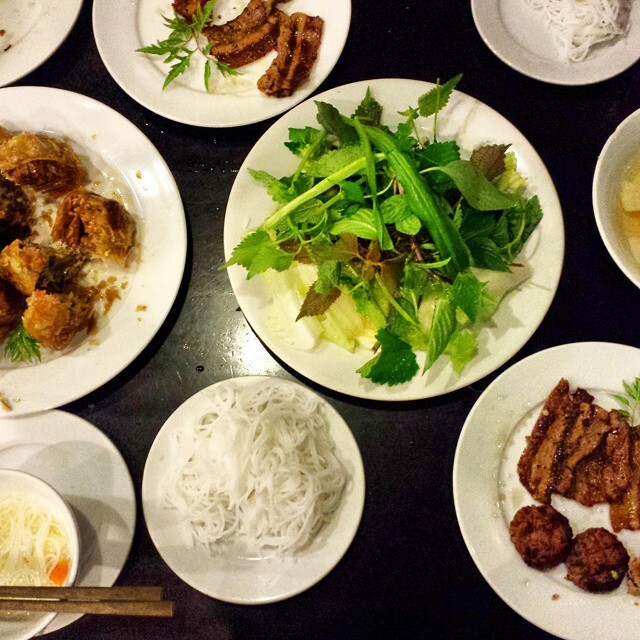 For dinner, we went to Quan Nem. This restaurant only serves 2 food items in their menu: spring roll (cooked in Northern Vietnam style) and Buncha (bacon with 3 small burger like patties). And I promise it's the best! Me and my hubby we're lusting over it even after we've arrived from our trip. Ahahha! After our dinner, we then went to Highlands Coffee for some desserts. Their passion fruit cake is good and their coffee is a must try. Find out more about my food explorations in Vietnam. Check out my previous post titled Vietnam's Glorious Feasts. We then retire for the night at my brother in law's place. Aaaahh!! We'd definitely need a good night's rest for tomorrow's activity.